VATICAN CITY (CNS) — The story of God’s love for humanity is starkly clear in a crucifix — redemption is possible because the Lord took on the sins of the world, Pope Francis said at morning Mass. “The crucifix is not a decoration; it’s not a work of art with many precious stones like you see. 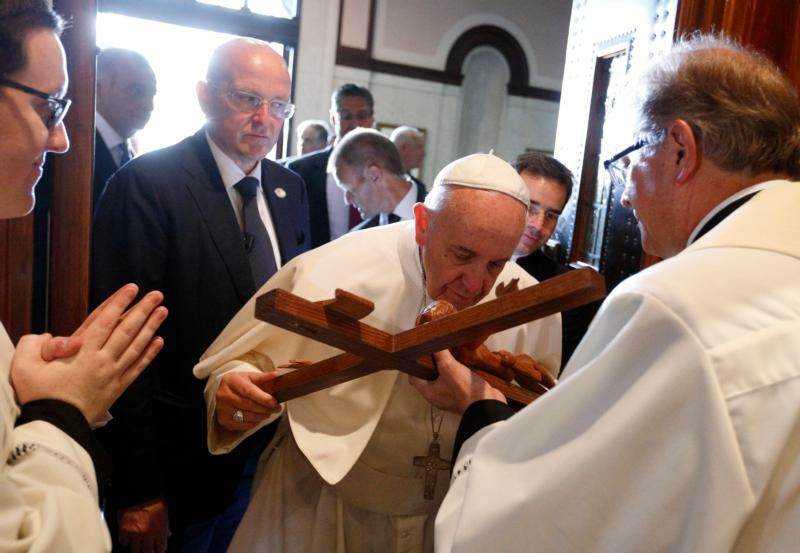 The crucifix is the mystery of the ‘annihilation’ of God out of love,” the pope said March 15 in his homily during the Mass in the Domus Sanctae Marthae, where he lives. Sin is the work of Satan, and Jesus defeats Satan by “making himself sin” and being raised on the cross, the pope said. The day’s first reading, from the Book of Numbers, recounted how the ancient Israelites were being bitten by serpents in the desert and the Lord told Moses to make a serpent and put in on a pole, then anyone who looked at it after being bitten would live. In a similar way, the pope said, looking upon Jesus on the cross shows people how they are healed from the eternally deadly effects of sin.